Glenn and Nancy Marin met as high school seniors on an AMHSI trip in November of 1977. They then went on to marry, raise a family, and finally to return to the AMHSI campus as part of their trip to Israel for their daughter’s wedding who made aliyah. 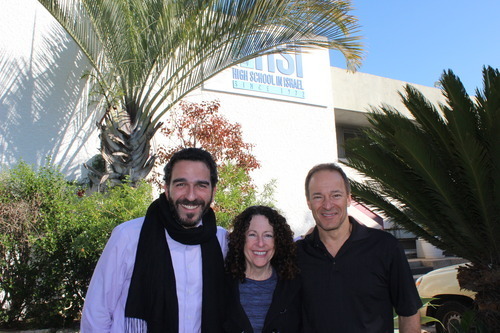 Following a tour on campus to see how things have changed over the decades, Danielle Weinberg, Marketing Manager at AMHSI, sat down with them at our new campus radio station to hear a bit more about their story. Question: I’m here with Nancy and Glen Marin from Florida, AMHSI alumni from November 1977. Thank you both for coming. Nancy: You’re welcome. Thanks for having us. Q: What grade were you both in when you did the AMHSI program? N: We were both seniors in high school. We both attended the quinmester of November 1977. Q: Wow. That’s amazing. Who were some of your teachers? G: Our teacher was Gabe Ende. We had him most of the time, but we also had Bradley Kipper who stepped in initially when we first got there, while Gabe was on military service. Q: Are you still in touch with him at all? G: No, not at all. It would be great to see him. Q: Are you in touch with any of the people you attended the program with? N: Yes, we actually have a very good friend who lives in south Florida. She actually keeps in touch with many of our participants from our quinmester. It’s kind of neat. To read the rest of the transcript, see here.